(Natural News) Umeboshi plums are rooted in Japanese culture and have been used in Asia for centuries, both as a unique foodstuff and as a natural remedy for an array of ailments and total immune system support. The umeboshi plum, or “Japanese salt plum” as some like to call it, is highly regarded for its impressive health benefits. What makes umeboshi so special is the pickling process it goes through: The plums are pickled in barrels with salt and shiso leaves, with the whole process taking about six months. During this period, the plums develop natural enzymes, bacteria and organic acids — and a superfood is born. Legend has it that Samurai used the umeboshi fruit to increase their stamina, prevent fatigue and support healing between battles. The alkalinity of umeboshi is part of what makes it such a beneficial food. As sources explain, conventional Western diets tend to increase acidity, so foods that promote alkalinity (like umeboshi) are key to maintaining balance and supporting overall health. But one of umeboshi’s most impressive benefits is its ability to support immunity and stimulate detoxification across the body. Studies have also found that taking dried or pickled plum supplements could even help prevent bone loss in post-menopausal women. Pickled and fermented foods like umeboshi have long been recognized for their health benefits, at least in the world of natural medicine. 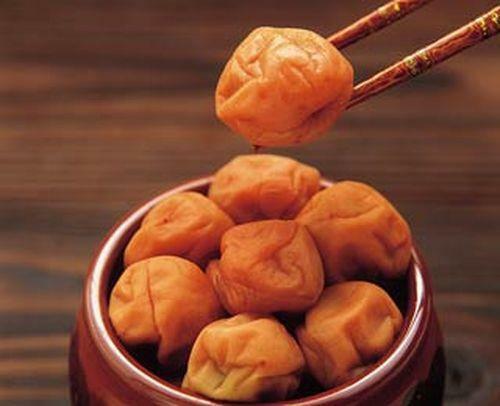 Umeboshi can be found at most natural health stores, in either the form of whole plums or a paste. The sour, salty fruit can be used to make a healing tea or consumed whole, while the paste can be used in a variety of ways. Umeboshi paste has become an especially popular ingredient in vegan cooking, thanks to its savory flavor. Some even use it as a substitute for cheese. As sources note, umeboshi is also considered to be a good source of minerals like calcium and iron. Umeboshi are just one of many beneficial pickled or fermented foods. Research has shown that many traditional foods from Asian countries, like kimchi or gobo, offer astounding health benefits. Gobo, another Japanese staple, has been shown to actually improve intestinal health — an impressive feat researchers have attributed to beneficial bacteria and enzymes found within the fermented root. Gobo is made from fermented burdock root, and in 2016, researchers found that during the fermentation process, beneficial enzymes are produced. “We have completed three years of research on fermented gobo and we’re beginning to understand what component of the fermented product has this beneficial impact on bacteria in the colon. We’re excited to do more research to reveal how and why Aspergillus-fermented foods and enzymes, especially acid protease derived from Aspergillus, have positive health effects,” said study leader Norihisa Kato, Ph.D.
Kimchi, a spicy, fermented staple of Korean cuisine, has also been praised for its myriad of health benefits — and has even been dubbed one of the most powerful probiotic foods you can eat. There is no shortage of beneficial pickled or fermented foods, it seems. Learn more about what you’re eating at Food.news.